URBANA – If someone agreed to buy your home as is a year from now, you’d likely cancel the kitchen remodel. According to a study at the University of Illinois, Kentucky tobacco farmers adopted that same logic when the tobacco companies announced the buyout – also known as the Tobacco Transition Act of 2004 that ended a 66-year-old federal farm program. However, the immediate drop in productivity was followed by startling changes. Over the 10-year period of the study, the number of farms declined from just over 40,000 farms to just over 8,500 farms – but productivity increased by 44 percent. 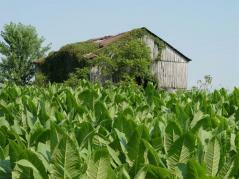 After the buyout, the total acreage farming tobacco in Kentucky declined, but the remaining acres became more productive. They began producing more tobacco per acre on fewer acres. The acreage also relocated to the western part of the state where the soil is more suitable. The study found that the most productive farmers were also the most diversified with crops other than just tobacco. According to Kirwan, the diversified farms already had equipment, such as drying barns to cure the tobacco. After the quotas were lifted, they could capture the economies of scale. Farmers were also able to save due to input reallocations, such as being able to shift fertilizer and electricity and workers. Kirwan said the findings from the study can be analogous to other commodity programs. “In agriculture, there have been these types of farm programs for about 80 years and there is some variance, but this was one of the few times that we could see an absolute end to a program with no hope of coming back. “Other programs may not be as binding as the tobacco program with quota limits, but when we’re distorting the market price with subsidies or we’re distorting a farmer’s production choices by saying, ‘If you grow vegetables, then you no longer get subsidies for your corn,’ then we’re distorting their productivity,” Kirwan said. He noted that the study focused on productivity, not equity. So although the farms were much more productive, it did put many small farmers out of business. He said the findings could help guide policy makers who are deciding whether or not to change quota or subsidy programs. “They have to weigh this potentially huge efficiency gain with the consequences on the equality side – possibly creating fewer small farms. Which is more important? Having a lot of small farms or fewer, more productive farms? “Aggregate and Farm-level Productivity Growth in Tobacco; Before and After the Quota Buyout” was published in the American Journal of Agriculture Economics. The article was co-authored by Shinsuke Uchida and T. Kirk White. Some funding was provided by the USDA.